There are many challenges to consider when completing a Global Health Elective, whether locally or abroad. In our 3rd part to this series Catherine and Haley examine the challenges they expect to face during their time in Tanzania and Thailand. Can you name some challenges you expect to face during your elective? I have only met a few people living with HIV/AIDS – a woman with remarkable inner strength who acquired HIV during the Rwandan genocide; a man who regretted his wild youth of injection drugs. To help prepare my mindset for the challenges of working in an HIV/AIDS agency, I have been reading as much as I can about the epidemic. Randy Shilts’ And the Band Plays On describes why AIDS was allowed to spread unchecked during the early years of the epidemic; Elizabeth Pisani’s The Wisdom of Whores takes you from Jakarta to Geneva to explain why in the past three decades, despite spending billions of dollars, we have been unable to curb the epidemic; Stephanie Nolan’s 28 Stories of AIDS in Africa vividly narrates the individual experiences of hope, love, and courage from people living with AIDS and their loved ones. Despite this immersion, I expect to be overwhelmed while at PASADA. I am in my final year of a MSc in community health and epidemiology, where I am writing my thesis in the field of maternal and child health. I completed a BSc at the University of Toronto, specializing in global health. I first discovered global health when I happened upon the Human Development Index as a preteen and wished to better understand disparities in population health. I am delighted to be joining the interdisciplinary team of Dalhousie students travelling to Tanzania, and I look forward to learning first-hand about the challenges and opportunities related to the care and management of HIV/AIDS in Dar es Salaam. One personal challenge I commonly face with the idea of international electives is the use of local human resources. I worry that there is a lack of reciprocity between the students, like myself who are learning and the host site’s resources. While completing international electives there are competencies and objectives a student must fulfill. In meeting these requirements the student may require input and resources from the host site, such as training from their preceptors. This is a challenge, I know I will personally face. Conversely, the student-preceptor relationship may also be a mutual exchange, as students tend to challenge their preceptors by bringing a fresh perspective and asking questions. In settings where there are limited resources, students can also assist in extending services by providing additional person power once they have developed the necessary skills. For these reasons I can help rationalize some of the resources I know I will use. Another concern I have is the communication barriers and unfamiliarity with cultural practice. Communication is a key component in the foundation of medicine, which enables empathetic and productive interactions with patients. Different local customs and norms may limit a foreign student’s ability to communicate through body language and verbal communication. I am therefore very grateful for our language training and opportunities to meet with previous students to discuss some of the cultural practices. Education and fieldwork are investments in human capital; therefore I will also find it challenging coming to terms with the sustainability for host countries once we have completed our placement. I am always aware and concerned that I may limit placements for local students who would eventually work as local physicians. I am therefore grateful of the longstanding relationship Dalhousie has with Khon Kaen University in Thailand. On previous electives I was fortunate to be placed in a setting where I could collaborate with local occupational therapy students for translation and knowledge sharing. I am hopeful I can once again link up with local students to collaborate and learn form each other. Throughout these experiences I recognized that we don’t have to travel to experience and be an advocate for global health. I started to get involved in local global health programs such as the Aboriginal Health interest group, universities allied for essential medicines and local global health initiative programs. I gain a sense of energy and enthusiasm from these programs and am always learning from my peers, international partners, and experiences and therefore find them extremely rewarding experiences. Thank you to Catherine and Haley for sharing these insights. We wish them rewarding and collaborate experiences and look forward to hearing more when they return. Our Summer Program students have all arrived at their destinations and are into the language training component of their elective. This is an exciting and stressful time as they prepare themselves for new clinical and cultural experiences. Before they left we asked some specific questions; here is #2 of 3 in the series. What are the 3 things you are most looking forward to about your upcoming Global Health elective? I am excited to combine the knowledge and skills I have gained through my BSc in global health with my MSc in community health and epidemiology. At PASADA, I hope to engage in research – from surveillance to clinical studies – as well as shadow community health programs from education to counseling. I am also curious to learn firsthand the challenges of healthcare in a low-resource setting. Finally, I cannot wait to discover more about the country itself. Following my placement, I will be spending three weeks learning about different corners of Tanzania. I realize I will only be skimming Tanzania’s surface, but I look forward to watching animals migrate in the Serengeti, summiting Mount Kilimanjaro, and lazing on Zanzibar beaches. I am most looking forward to the cultural experiences, working with the local students and the patients I encounter. The Thai culture is one I am excited to experience first hand. From the food, the people, the art, music and the landscape, Thailand offers a unique cultural experience. As Khon Kaen is not a typical tourist destination, I am looking forward to being immersed in the Thai lifestyle working in the hospital alongside local Thai students and physicians. I am very much looking forward to partnering with local students to better understand their experiences in student life and enhance cultural knowledge with respect to medical practice. As Canadian students, we learn from our preceptors and the local students, by working alongside and learning from their diverse experiences. While completing international fieldwork through a previous degree in Tanzania, I had an incredible experience working closely with local students comparing and contrasting our approaches to care and learning about each other’s culture. Working together in a mutually respectful learning environment. Lastly, I am excited for the experiences and encounters with Thai patients. I believe this will offer me insight on cultural differences while treating patients from diverse backgrounds. The common diseases and conditions in Thailand vary from Canada and I anticipate learning a lot about these conditions not typically seen in Canada. About 6 years ago, when I was volunteering in Nepal I was exposed to a variety of medical conditions I never imagined I would witness. There were new diagnoses of leprosy and many traumatic injuries from fire and motor vehicle accidents. It was a stark contrast to Canada, offering incredible insight to witness conditions and injuries that are rare or nonexistent in Canada. The Global Health Office is excited to have another group of students participating in our Global Health Summer Programs. This year, students in Tanzania, Thailand and The Gambia were asked to respond to 3 questions about their experiences. Over the next few posts we will share these responses with you. Question 1: What draws you to pursuing a Global Health Elective? What draws you to an elective in your specific country? As an undergraduate student, I specialized in global health. I learned through lectures and lively classroom debates about concepts in global health – the intertwined domains of health, education, poverty, and the economy; the importance of ethical and human right issues; the burden of disease – but I never had the opportunity to experience first-hand global health outside a Canadian perspective. A decade ago, I had the opportunity to visit Kenya. This was my first time travelling in a developing country, and while I marveled at the pristine beaches of Mombasa, the wilds of the Masai Mara, and the warmth of Kenyans, it was also my first true exposure to poverty. When the opportunity arose to return to East Africa through Dalhousie’s Global Health Office, I knew I wanted to learn more about Tanzania, and specifically more about the fabric of Tanzania’s health system. Participating in global health offers unique challenges to be creative while taking initiative and learning in a non-conventional environment from colleagues and peers. For these reasons I find global electives personally challenging yet fulfilling. There is a plethora of knowledge, skills and insight to be gained from our international partners. Not only that, but international electives provide opportunities to enhance ones education and future practice by educating professionals experienced working in different settings, cultures and language. 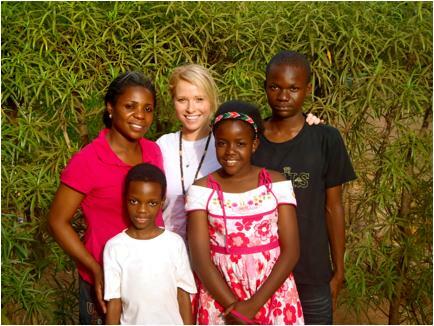 During my occupational therapy education I completed part of my training in Tanzania Africa. This was my first experience abroad in an academic program, where I learned valuable clinical skills through my colleagues in Tanzania. Based on these invaluable experiences I am motivated and excited about the elective in Khon Kaen, Thailand. I view this as an opportunity to continue and foster my passion for global health while communicating and working with peers and leaders with similar interests in a foreign environment.